It’s summer and can you believe we have a heat wave in the UK. I’m super grateful. My hair, however, is not and is rude about it. The dryness is very real. This post will be my 4 steps to Ultra Moisturised Hair. 2 Why Co-wash relaxed hair? 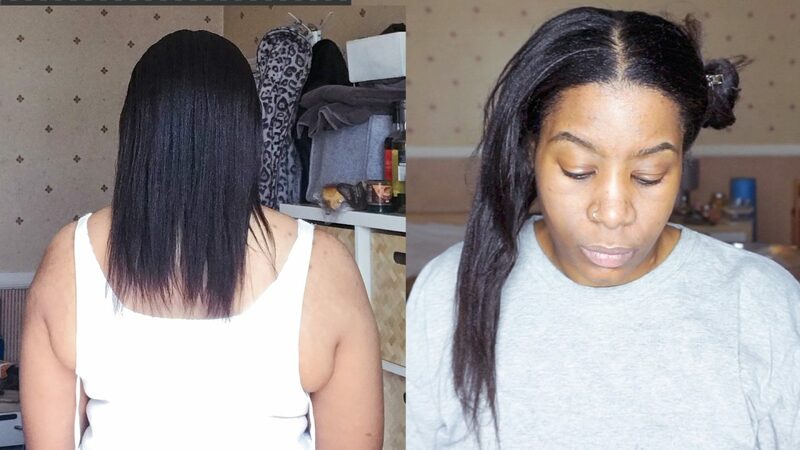 3 How to Co wash relaxed hair? Co-washing is a method of cleansing the hair and scalp. It is a refresher and a good moisture boost. Plus, you can do it all year round. You can use any conditioner, usually it is a moisturising one but can be protein just depends on what your hair needs. 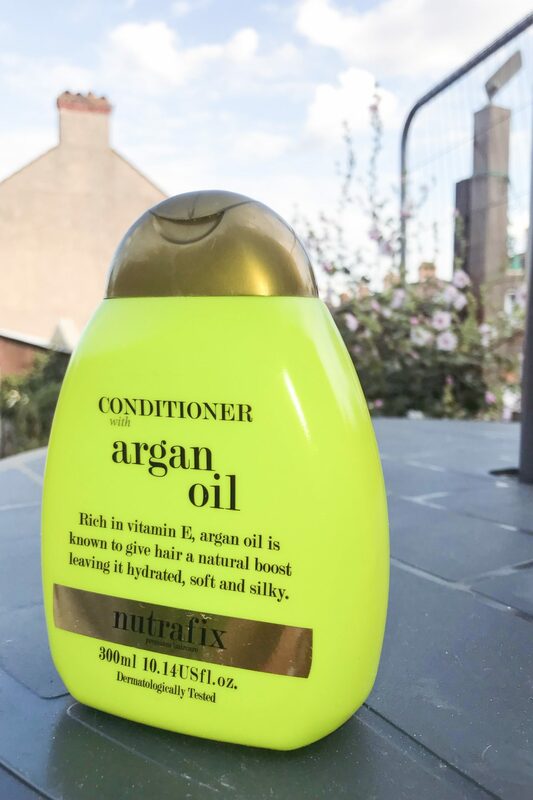 I’m currently using a Poundland brand Nutrafix Argan Oil Conditioner. The ingredients were impressive. Pro Tip – In Hair Care the most important ingredients are the first 5. Why? because the from the first ingredients downwards is in decending order. Therefore I pay more attention to the first five as those are the largest quantities and if there’s any protein in the product. Aqua – water is usually the first ingredient in hair products. Cetearyl Alcohol – This is used as an emollient (moisturising) and conditioner. This would generally be in the first 5 of conditioners and considered the backbone. Panthenol – is a form of Vitamin B5, and is used as a moisturiser and lubricating compound. I judge a conditioner by three things. Cleansing ability – I pay attention to does it strip my scalp and hair. Slip – once the conditioner is on my hair does it allow me to detangle easily at the very least with my fingers without breakage. Moisture – the optimum condition of my hair is juicy, moist and maintain elasticity. Does it meet that? This conditioner was meh for me. It cleansed well, slip and moisture were mediocre. Having a conditioner with slip makes a conditioner multi-purpose. Let’s say you have taken out braids this conditioner would be on of the first things I would reach for. I will finish the bottle and will try the others – Jojoba, and Coconut Milk. I need more moisture and of that because I will give this 3/5 stars. Years ago I would co-wash twice a week, right after I had played sports as my scalp sweats A LOT and the sweat had a tendency to make my hair dry. So, in comes co-washing to save the day. How to Co wash relaxed hair? There are two methods of co-washing. 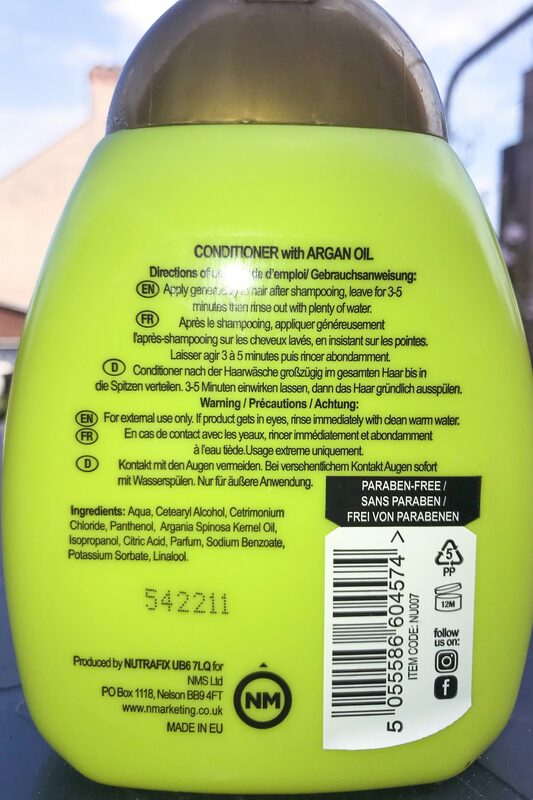 The first is using the conditioner, in the same way, a shampoo is used. Wet your hair then apply the conditioner to the scalp and the strands. Then deep condition as normal and apply a leave in. Step 1 – I start the process of parting my hair in halves then 3 sections in each half. I have a mixture of my staple deep conditioner(s) and oils. [see them on My Relaxed Hair Regimen page] I apply the deep conditioner to my dry (and dirty hair). I do this because my strands will soak up the conditioner better. Step 2 – I go under the steamer for 25 mins to allow the conditioner to soak in. Then I rinse. 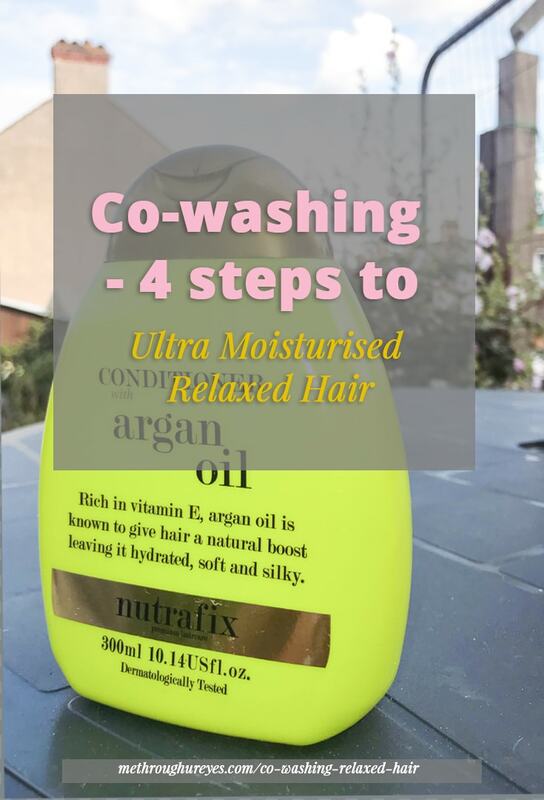 Step 3 – I apply a conditioner, in this case, it is Nutrafix Argan Oil I rub it in – with my finger pads – to my scalp and hair strands as it was feeling extra dry. I do this process twice. Then rinse. Step 4 – I tee shirt dry (i don’t use a towel as they are abrasive) to soak up the excess water (instead of a towel) for 30 mins. I apply my leave ins. My Relaxed Hair Regimen. Co-washing is a life saver for me and anyone that wants that extra boost. Yes, it’s another day of handling your hair but I say give your self 2 months and monitor how you hair responds. Trust me in the warmer months you won’t regret it. Winter might be tougher. That just depends on where you live in the world. Do you co-wash? or will you be trying? If you do co-wash what’s your conditioner favourite to use? I have never done this or heard of this, but it sounds like it would definitely give an extra boost of moisture. It is pretty new and it has loads of other lines. Give them a try. I love this product! I currently use it and so does my sister! Your blog is our daily dose of what’s cool and trending in the world. I love this brand! I have the coconut and tea tree oil one! I’ll have to give this a try as well. My hair does need help. They’re so cheap and worth a good try. I’ll check the ones you’ve mentioned. My hair is in dire need of moisture. It is inherently straw-like and dry just like my mom’s hair. I love hair products that contain argan oil and have to give this product a try. Thanks for explaining ‘co-washing,’ I had heard of it and never really understood what it was or how it worked. ahh you’re welcome lovely. My hair went through a stage of being very dry so I know it can be frustrating. For me, it was my methods and products. When you do find that happy medium, you’ll have a new lease of life. I can help, maybe start off with a light conditioner and go from there. Argan oil is like magic! I love using it. I love using oil in my hair it helps me loads. I’ve actually never heard of co-washing! It sounds like it works great! Definitely does for me. Glad I could help. This is informative. Great tip about the first five ingredients. Thanks for sharing. It’s helped me loads. When Argan oil was hot in products it stopped me from buying products that weren’t gonna help. I’ve tried low shampooing but never co-washing! I would be curious to give the method a try. Might be worth a try with a lighter conditioner. could help. I would say that co-washing is really effective. I have dried ends due to frequent dyeing. And this one, really, is a life saver. Oh, thanks for the tip. Maybe, I wouldtry protein treatments too. Thanks a lot! you’re welcome. Figuring out my hair took a while so if i can pass on nuggets i will. On those days where i’m having a very dry hair day after playing sports, this is my pick me up. you just got me googling what you have to deal with as i never heard of it before. I knew oil is produce naturally and when your scalpl is dry it over produces oil. Apparently what you would need to do is use a oil contorlling shampoo. ALso “multi mask” your hair. Crazy right? a clay prepoo (before you shampoo) then add a hydrating deep coniditoner on your ends. It makes sense as your skin acts the same way. The human body is mad. These are some great tips! My daughter has very dry hair here in Texas, I will have to try some of these ideas on her. Thanks for sharing! Thank you. It has helped me so much. I hope it helps your daughter too. I co-wash both my son’s and my hair. 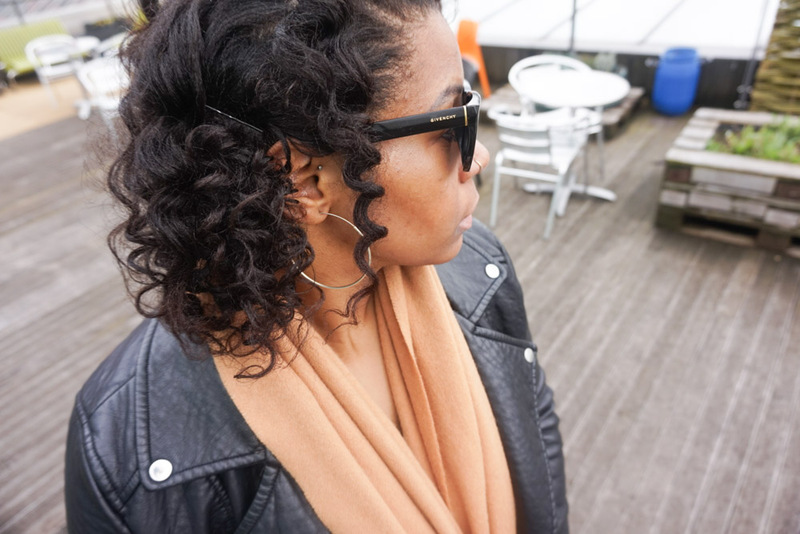 We use the method that we found on Curly girls facebook group. It’s incredible how co-washing has saved our curls! AHh, another co-washer. It can be a revelation for some and glad it has helped you as much as me. Finding the right conditioner for your hair isn’t always easy. I’m always looking for ways to make pampering fun for me. Thanks for sharing your tips. You’re so right. I have had that problem with a lot of different products. It can be expensive. Glad you liked it. It might be worth it. Wow, interesting finding. I never heard of this but I’m so willing to try this out. Will def. have to check this out. Thx for recommendation. SO interesting! I had no idea the first 5 ingredients where the most potent! I know right. When I found out it helped me not wasting money on miracle products.